Designers Welcome! Are you looking for that perfect accessory for your upcoming shoot? Or maybe that very special piece of french glassware to add a finishing touch for your client. I love working with designers and stylists! While I specialize in mostly table top items, you can find some amazing home accessories and furniture items on my site as well. Discounts – Discounts with no minimum purchases. All items on my website are eligible for a trade discount. Hold Items – Why yes, I will hold an item for you while you gain client approval! If required, you may take an item to the clients home for viewing and approval. Install Day/Photo Shoot Day Support – Local to Chicagoland? We all know you can never have enough hands on Installation Day or Photo Shoot Day. I offer my time by the hour during these days when it just seems like you can never have enough support. Same Day Shipping – Need it now and local to Chicagoland? Pending my schedule I can get it to you same day for a small fee. 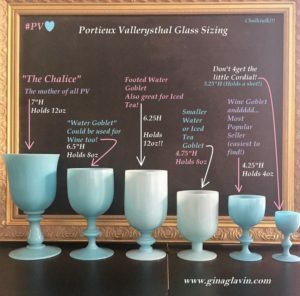 Rental – Want that perfect blue Opaline glass for photo shoot day? I will rent out most of the items you see on my website! Sourcing – I love looking for that perfect item to complete your look. Tax Exempt Purchasing- Nuff said! Once received and approved you will receive a code to use at check out every time you purchase. I will also include hourly rates and shipping rates for services described above.